Dill weed is often grown for its edible seeds and leaves, which are used as a seasoning or to flavor dill pickles. All parts of the dill plant are edible, though, with the flowers packing more flavor than the more commonly used seeds. The flowers have a tangy taste similar to that of the leaves, but it is more pronounced. 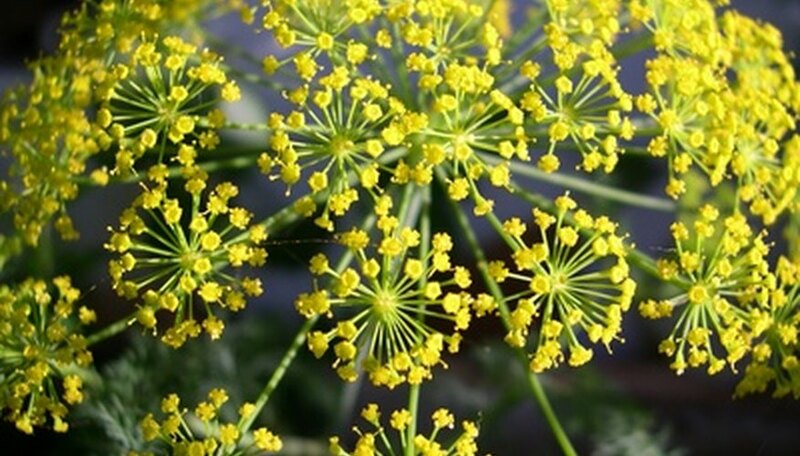 Use dill weed flowers fresh to get the most flavor and to add a their bright yellow color to your dishes. Later in the year, once the flowers stop blooming, revert to using the leaves and seeds instead. Harvest flowers when they are at the height of bloom with most of the small buds open. Cut off the flower heads in the early afternoon when the morning dew has dried off the plants. Choose healthy looking flowers that are showing no signs of wilting or discoloration. Trim off the stems from the flowers using sharp kitchen shears. Place the flower heads into a colander. Rinse the flowers under cool running water. Mist them with a faucet spray attachment if you have one, as this is less likely to damage the blossoms. Drain thoroughly after washing. Pat the flowers dry with a soft cloth or paper towel. Add the flowers to salads, hot or cool soups, and other recipes that call for fresh dill leaves. Add the dill to taste, keeping in mind the flowers carry a stronger flavor than the leaves of the plant. Wrap unused flowers in dry paper towels and place into a plastic bag. Store in the vegetable crisper for up to one day before using. Generally, use half as many fresh flowers as you would dry dill leaves in a recipe. Adjust the amount to taste and to fit the flavor strength of the dill in your garden. Only harvest dill from plants in your garden and those that you know have not been sprayed with any pesticides or herbicides. Dill flowers and leaves do not dry well. The leaves can be frozen for later use but flowers are best used shortly after picking while they are still fresh.